Earlier today, I barely made my flight. Traffic was moving so slowly, and most lanes were blocked due to snow banks. Thankfully the flight was delayed, and YES, I should've left earlier. I had checked in online, like a good Silver Preferred Dividend Miles member and then hustled to the airport to print out the boarding pass and check my bag. Quick question: Are the parents of unaccompanied minors allowed to use the Dividend Preferred/First Class line?!?! My stance, is NO. Somebody tell me if I'm wrong. While waiting to board my flight, I was listening to the gate announcements. At issue was a flight to New Orleans. Evidently these passengers have been stuck at the airport for a while. The gate agent announces 5-6 names and then mutters into the microphone, "We're not going to board these people." Say whaaaaaaaaaaat? I can only imagine. Then the same guy made an announcement asking for volunteers to give up their seats in exchange for $500 vouchers. When there were no takers, he made another announcement, "One of the people in the boarding area just had a suicide in the family and needs to get to New Orleans." Seriously!?!? Isn't that too much information? Couldn't he have just said, there was a death in someone's family? While waiting, I charged my iphone and started chatting it up with a guy from New Orleans who was trying to go home. We started talking about Drew Brees. For any of you that are Drew Brees fans and/or saw that video of him leading a cheer at a local bar (i.e. I saw the clip yesterday while watching "Rome is Burning") ~ that bar's name is Lucy's. Have fun tracking him down. Boarded the plane and then this oddly shaped older man ends up having the seat next to me. He's shorter and kinda resembles an "egg" since he was roundest in the middle. The egg goes to sit next to me and then notices his seat is wet. I look and there appear to be 3-4 drops of water on his seat. He asks me if handbag is leaking. Really?!?! Why would I carry anything in my Dior that would leak. Then he says he's going to get some napkins. My inside voice is saying "Whatever, egg... Do what you want... I didn't get your seat wet." I ignored him and didn't say a word to him the entire flight. I don't like eggs. We get to Dallas, where the 12 inches of snow has begun to melt. It's on the ground, but the roads are clear. I take a cab to the hotel. 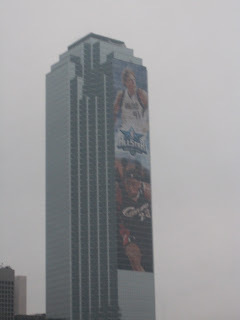 Incidentally, I see a building with a large picture of Dirk Nowitzki (duh, he plays for Dallas) and LeBron James. Noticeably absent was Kobe Bryant. Just saying. I try to check in and my name's not the primary name on the reservation. I expected that. Problem was, I was also not the secondary name on the reservation. After a quick call from my friend to the Front Desk Manager, I'm "checked in" and starving. I drop the bags off in the room and go back downstairs to survey the scene and figure out if I want to eat in a restaurant or have room service. I cover some ground and then hit the main entrance, where within about 5 mins of checking into the hotel ~ there he is, Danny Ferry. I immediately turn around, walk the other way and decide room service it is. I'm not in the mood to run into/talk to/make eye contact/interact with him on ANY level after our interaction in 2008. I can be nice and ignore him, but I'm not sure the opposite is true. I relayed the story to my friend earlier today, before she boarded her plane and she just said, "Welcome to NBA All-Star." HAHA. It's going to be a long weekend! 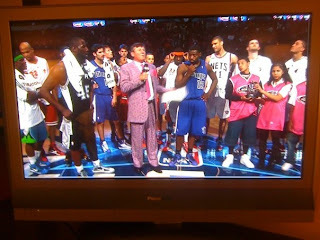 Incidentally, did anyone check out the Rookies v Sophomores game and see Craig Sager? Here's a pic I took of him on TV. Yes, the TV colors are correct, that's really Craig Sager's suit. It hurts my eyes.